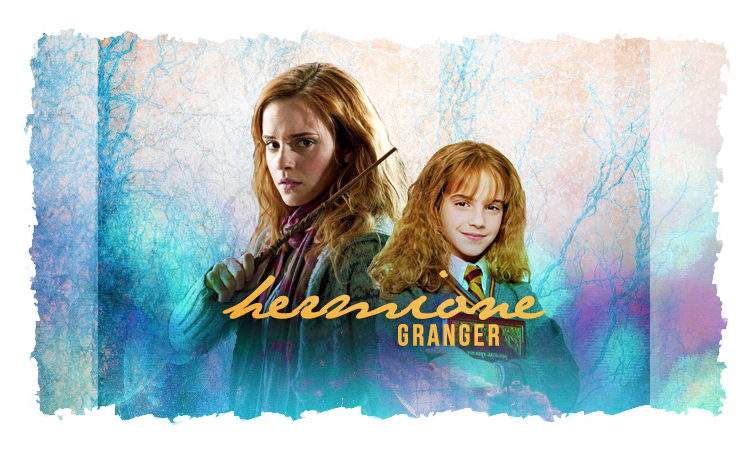 Granger Geeks [ Hermione Granger ] #12 - "Fear of a name only increases fear of the thing itself." "the glue" that holds the three of them together. efforts towards house elf liberation. her future husband, Ron Weasley who she would have two children with, Rose and Hugo. quite as pathetic?" said Malfoy. "And he's supposed to be our teacher!" SMACK! She had slapped Malfoy across the face with all the strength she could muster. "Hermione!" said Ron weakly, and he tried to grab her hand as she swung it back. Hermione pulled out her wand. Malfoy stepped backward. Crabbe and Goyle looked at him for instructions, thoroughly bewildered. disappeared into the passageway to the dungeons. Professor Lupin: "You're the cleverest witch of your age I've ever met, Hermione." and knows me," she snorted, "as Hermy." every single person in this school will read your interview, it was banning it!" during Christmas because there aren't enough hats!" anxious to give you sufficient practice. Hermione snorted. "Well honestly... 'the fates have informed her'... Who sets the exam? She does!" "Twitchy little ferret, aren't you, Malfoy?" or worse, expelled. Now if you don't mind, I'm going to bed." "At least no one on the Gryffindor team had to buy their way in. They got in on pure talent." "Please, Professor McGonagall--they were looking for me." I--I thought I could deal with it on my own--you know, because I've read all about them." friendship and bravery and--oh Harry--be careful!"